kindness. We recommend Palazzetto Rosso to lovers of design and “all things beautiful” or to those looking for impeccable service. 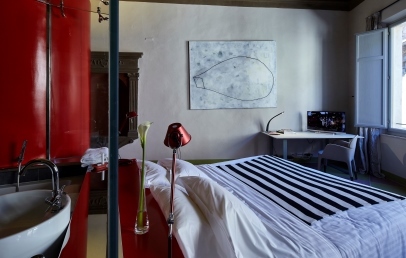 A beautiful hotel in the old town centre of Siena, Palazzetto Rosso can be found in via Dei Rossi, a stone’s throw away from Rocca Salimbeni – over which some of the hotel’s rooms offer views. 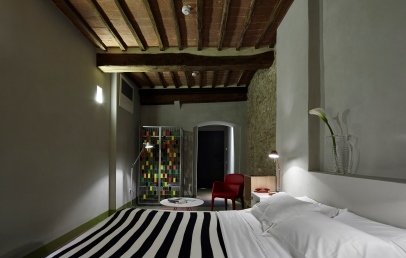 Ideal for getting out and exploring the city, the hotel is a short and pleasant stroll away from Piazza del Campo and the Torre del Mangia, the stunning cathedral, the Basilica of Santa Maria in Provenzano and all of the city’s other important monuments. 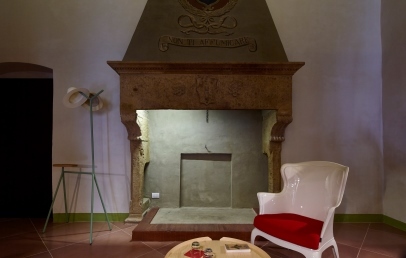 The ancient brick building that once upon a time received wayfarers in the heart of Siena is now home to Hotel Palazzetto Rosso – a former inn that today upholds its same function and architectural lines as in days gone by. 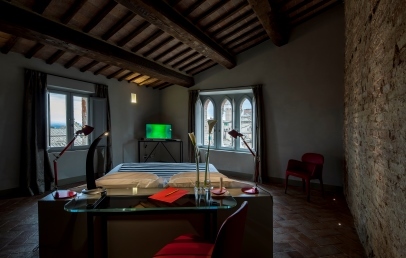 The brick façade, the large ogival arches, the wrought iron candelabras… Little seems to have changed since the 13th century, but cross the hotel’s threshold and you will be engulfed in the creative freshness of Palazzetto Rosso. 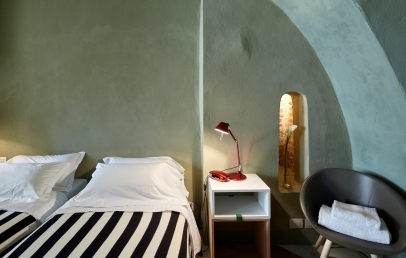 The majestic arched hall provides an introduction to the hotel and gives a preview of the ambiance: the red of the brick walls and the richly frescoed ceiling are the grandiose setting for the Casamania Bistrot tables, the brightly coloured 3D chairs and armchairs, the Muuto Oslo armchairs, the Artemide lamps and a whole universe of designer objects. 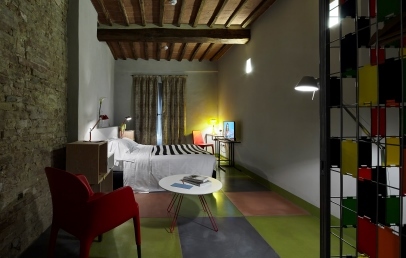 Striking an unexpected balance between mediaeval architecture and contemporary design, the hotel’s rooms join together the precision of wooden ceilings, exposed bricks and tiled floorings with the vivacity of the furnishings, fabrics and design objects. The 9 rooms are true works of art, colourful havens with a sparkling atmosphere that enter into an ongoing dialogue with the historical soul of the city. The generous sweet and savoury buffet breakfast is made up exclusively of top-quality products selected from the region’s best producers: seasonal fruit, fresh bread and pastries, honey and marmalades, yoghurts and cereals, fruit juices, cheeses and cold cuts. In the afternoon, the hotel offers guests a snack of cakes, dry pastries, fruit juices, teas and herbal infusions. The hotel’s wine cellar organises tastings of the most prestigious Tuscan and national wines, served with local cheeses and cold cuts. The bar also offers aperitifs, hot drinks and fresh fruit juices. The hotel offers guests free Wi-Fi connection and use of the Business Corner – an area equipped with tablets, a scanner and printer. Services available at a supplement: Chauffeur service and the use of the covered secure car park, laundry service, fitness sessions and reservation of guided visits and excursions. The hotel has few parking spaces in a guarded car park, with Valet Parking service and therefore it is necessary to book in advance. During the period of the Palio it is necessary to book and pay at least 30 days in advance (€ 50 per day). 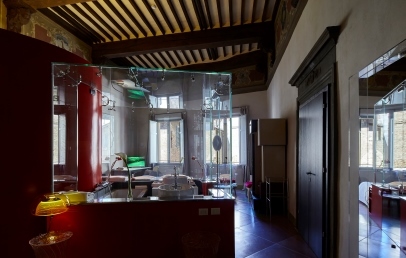 A double room located on the first floor, Double 1 overlooks a quiet street and from its window guests will be able to admire the dome of the church of Santa Maria in Provenzano. 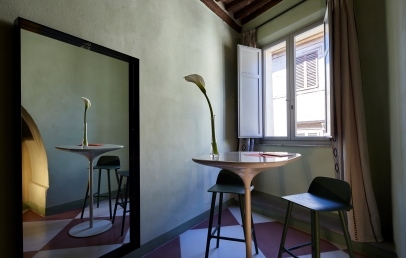 The traditional terracotta and wooden beam ceiling are offset by the 14oraitaliana flooring, the Casamania Vad chairs, the Artemide Tolomeo Micro lamps and the Seletti multi-coloured metal shelves. Striking an original balance between the ancient and the modern, Double 2 alternates the traditional dark wooden ceiling with the patchwork coloured 14oraitaliana flooring, the ancient bricks of the exposed mediaeval walls with the multi-coloured designer furnishings: the Matali Crasset wardrobe, the Casamania Twine table, the Ester armchairs in red leather by Patrick Jouin, the Tolomeo Terra e Aurelia lamps, the Rubelli Venetian fabric double curtains. Double 2 is adapted for guests with reduced mobility. A majestic double room located on the first floor, Suite 3 has two large windows overlooking Rocca Salimbeni and is breath-taking in its grandeur: 5-metre-high ceilings, huge wooden beams held up by sculptured supports, frescoed walls, monumental fireplace and recesses edged with painted bricks. The mediaeval structure provides the setting for a triumph of contemporary design. Centrally positioned, a large red cube contains the bathroom (the toilets are separate) that overlooks the room with two glass walls. A lively universe of design objects populates the suite: from the 14oraitaliana designer flooring to the Casamania Ruben coat rack, from the Pedrali Pacha armchair to the Muuto Around table, from the large Cathalijn Wouters canvas to the beautiful Maarten de Ceulaer designer suitcase wardrobe. 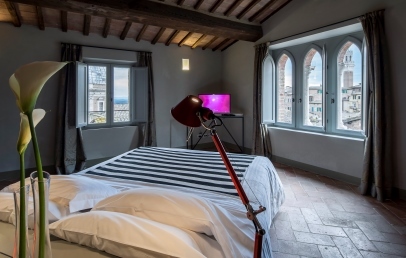 One of the hotel’s most beautiful rooms, Suite 4 has four windows overlooking the Contrada della Giraffa, with stunning views of the dome of the church of Santa Maria in Provenzano. Large and imposing, the room has wooden beams held up by sculptured supports and is split into a bedroom with desk and a day area with comfortable chairs. 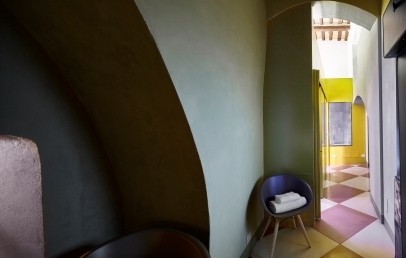 The bathroom is enclosed in a yellow cube with a large window looking out over the rooftops of Siena. Located on the second floor, Double 5 stands out thanks to the distribution of its spaces, creating an interesting arched perspective. 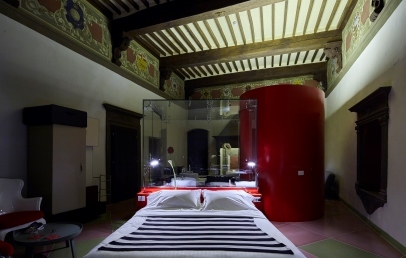 With a traditional wooden ceiling and white and red checkered flooring, the furnishings are contemporary and include, among other items: a Maarten de Ceulaer leather suitcase wardrobe, Muuto Nerd footstools, Boussac Santa Fe embroidered linen curtains. 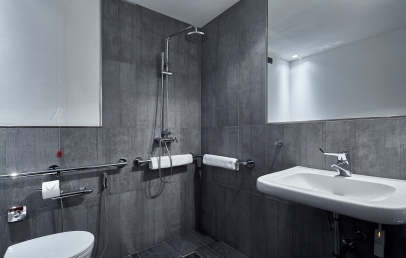 Upon request, the room is available as an interconnecting room with Suite 6. The second floor of the building is home to the spectacular Suite 6 with its large windows overlooking Rocca Salimbeni: more than 50 m² of floor space, 5-metre-high ceilings, wooden beams with sculptured supports, and frescoes depicting the emblems of the 17 contrade of Siena. This magnificent mediaeval setting safeguards the contemporary soul of the suite: the Maarten de Ceulaer leather suitcase wardrobe, the Ester chairs by designer Parick Jouin, the 70/70 table by TAF Architects by Muuto, the large Kartell mirror, the Cathalijn Wouters canvas, the Innovation sofa bed by Casa Copenhagen. 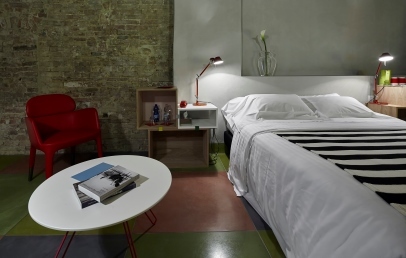 At the centre of the room, the double bed and the alluring glass cube that holds the bathroom (toilets separate). Upon request, the room is available as an interconnecting room with Room 5. 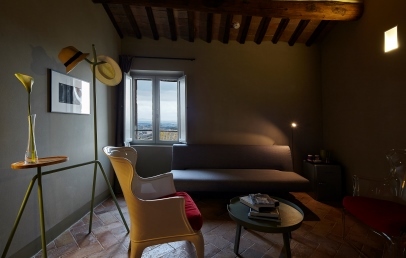 Located on the third floor of the hotel, Suite 7 stands above the city offering spectacular views over the churches of San Francesco and Santa Maria in Provenzano (to the south), over the Torre del Mangia and Piazza del Campo (to the west), and over the Tuscan countryside. To take full advantage of the views, the double bed has been placed in the centre of the room. The terracotta flooring, the wooden ceiling, the exposed brickwork, and the subtle lighting confer upon the suite a sophisticated and relaxing atmosphere. The glass desk, the Ester chairs in red leather by Pedrali, the Maarten de Ceulaer suitcase wardrobe and the Rubelli Venetian fabric double curtains complete the picture. The separate living room is furnished with a Casa Copenhagen sofa bed, Pacha armchairs by Pedrali and an Around table by Muuto. Striking an unexpected balance between mediaeval architecture and contemporary design, Superior 8 offers up its original wooden ceiling, terracotta flooring and a traditional low window with internal window ledge. The bathroom has a large window overlooking the room (toilets are separate), while the living-room-cloak-room completes the room, adding some colour with the multi-coloured metallic boxes that form the unusual Seletti wardrobe. Advance Booking Rate - Book at least 45 days in advance and get a 10% reduction on your stay. 10% reduction for stays from May 1st to 31st!